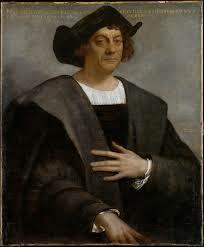 Many people in the United States celebrate today in honor of Christopher Columbus. (My college does not.) I’m not planning to enter into charged historical dialogue except to say that we now know most of what we learned in elementary school was wrong or intentionally misleading, a pattern that continues onwards in education. But that is a dark subject, which I will forego. Professor Razaf tells us, “He used the rhythm as a compass.” That’s something I can celebrate, as I hope you can. Often, “Blues for X” is a memorial for the departed X — grief in the shape of an improvisation. It’s thus a pleasure to offer this BLUES FOR SIR CHARLES, a celebration, not an elegy, for the remarkable pianist Sir Charles Thompson, born March 21, 1918, still with us, living happily in Japan (playing golf, I understand). Knighted by Lester Young, Sir Charles has and had a distinctly personal style: the casual listener could mistake him — for a few bars only — for Basie, and his rhythmic engine is just as reliable, but Charles heard and employed a broader harmonic palette than did the Count, so one is always delighted by the strong swing he engenders allied to the boppish harmonies. 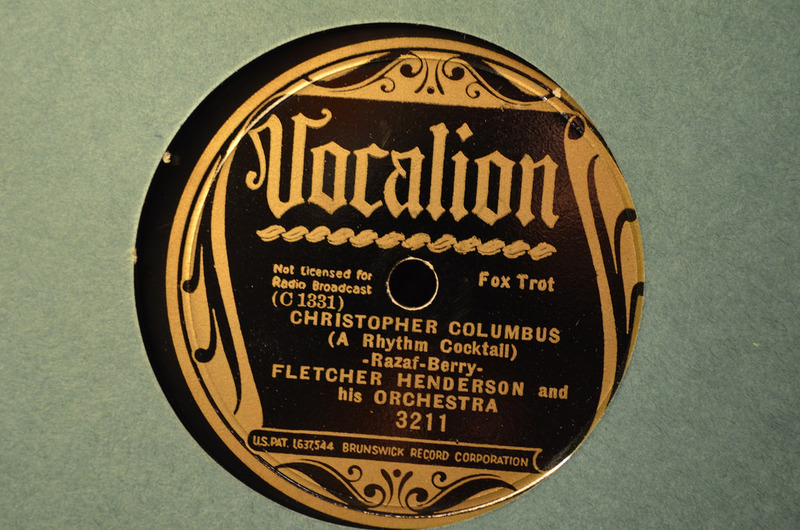 He’s recorded for John Hammond’s Vanguard series and also crops up memorably on the Columbia Buck Clayton Jam Sessions. My friend Bill Gallagher has created a Thompson discography, accessible here. Marc Caparone brilliantly manages to evoke a whole host of Basie trumpeters — Tatti Smith, Lips Page, Sweets Edison, Buck Clayton, Shad Collins, Bobby Moore — while sounding just like his natural self; Beau Sample rocks the rhythm in the great tradition of Walter Page, and Hal Smith’s sweeping hi-hat and accents in the final choruses could swing Mount Fuji joyously. And Master Skjelbred takes the opportunity to honor his hero with some deliciously unexpected runs and chords, suggesting not only Joe Sullivan on a straightaway but also Monk at Minton’s, 1941. If you can listen to the final minute of this performance — starting with the riffing hide-and-seek of Marc and Ray — without moving around in your chair, I wonder if your blood pressure might be dangerously low. Consult your physician. Do not operate any heavy machinery. I first wrote a few lines about Bryan Shaw’s most recent CD, THE BLUEBIRD OF HAPPINESS (Arbors Records) here, last year, because its music made a small sweet story possible. For those who have been listening to jazz recordings, I will say only that this CD has the savor of an early-Fifties Vanguard session, and that I have returned to it often with increased pleasure. I first heard Bryan on CD more than a decade ago, on his first Arbors release, NIGHT OWL. At the time, he was only a name to me — but the CD found him among others whose work I knew and valued: Dan Barrett, the late Brian Ogilvie, Scott Robinson, Chuck Wilson, Dave Frishberg, Jeff Hamilton, Bucky Pizzarelli, Joel Forbes, Rebecca Kilgore, David Stone, Eddie Erickson. I was impressed with the playing and singing of those people, but Bryan struck me as a true find — a trumpet player with a singing lyricism, deep swing, real imagination . . . and although you could play the game that Barbara Lea called “Sounding Like,” that favorite pastime of critics and liner-note writers, Bryan sounded most like himself. I had the opportunity to meet and hear Bryan in March 2010, and found all the virtues he had displayed on NIGHT OWL just as vivid in person. And, at one of our meetings, I said, “When are you going to make another CD?” Eventually, he told me about THE BLUEBIRD OF HAPPINESS . . . and now I can share it with you. This CD features Bryan, trumpet; Dan Barrett, trombone; Evan Arntzen, reeds; Ehud Asherie, piano; John Dominguez, string bass; Brad Roth, guitar / banjo; Jeff Hamilton, drums. And the songs are in themselves a telling guide to the breadth of Bryan’s musical imagination — reaching back to Clarence Williams and forward into the future with equal ease: LOVE ME OR LEAVE ME / ALL MY LIFE / WANG WANG BLUES / VIGNETTE / PAPA DE DA DA / SONG OF DREAMS / I’M JUST A LUCKY SO-AND-SO / OLD MAN BOWERS / BLOOMIN’ BLUES / I LOST MY GAL FROM MEMPHIS / ELLIE / BLUE ROOM / CHLOE / STRANGE BLUES / THE BLUEBIRD OF HAPPINESS. Four of these songs — ELLIE, SONG OF DREAMS, OLD MAN BOWERS, and BLOOMIN’ BLUES — are flavorful originals by Brad Roth: each of them with a distinctive character, so much more than lines superimposed on familiar chord changes. And the tidy, ingenious arrangements are by Dan Barrett, master of written charts and impromptu riffs and backgrounds. If you wanted a compact living definition of what Stanley Dance called “Mainstream” in the twenty-first century, this CD would be a vivid multi-dimensional example. The instrumental performances themselves are marvelous: Bryan’s trumpet, glowing or growling, seems to move from one beautiful phrase to the next without strain — no cliches here — and his solos have their own architectural sense, which translates into performances with shape, starting simply and rising to emotional peaks. To me, Dan Barrett has been a model of the way to play trombone since I first heard him about a quarter-century ago. Evan Arntzen shines on clarinet and saxophone, finding just the right lines to enhance an ensemble and creating soaring solos. And the rhythm section is all anyone could want: our splendid friend Ehud Asherie, who can merge Fats or the Lion, sauntering down the street (from one hot-dog stand to the next) with his own version of witty “modernist” swing. Brad Roth — whether on banjo, sweet rhythm guitar, or single-string electric, adds so much to the ensemble, as do John Dominguez (supple and solid) and the ever-surprising Jeff Hamilton. The overall effect varies from selection to selection, but I heard evocations of a Johnny Hodges small group, a live Basie performance circa 1940; a Buck Clayton Jam Session; the 1940 Ellington band, and more — and the performances benefit so much from what Ruby Braff used to do on the stand: to avoid monotony, he would subdivide a quartet into even smaller bands, playing duets and trios within it. BLUE ROOM offers us a trumpet-banjo verse; I’M JUST A LUCKY SO-AND-SO does the same but with trumpet and piano. Even though there are a few mood pieces, this is a reassuringly optimistic CD, from the absolutely delicious swing of LOVE ME OR LEAVE ME, ALL MY LIFE, BLUE ROOM . . . to the soaring (nearly operatic) assertion of the title song. Bryan believes in that BLUEBIRD, and the CD will bring happiness to anyone able to listen — and listen — to it in the right spirit. You can hear brief excerpts (each slightly less than thirty seconds) here and here, but I predict those tiny tastes will serve only to whet your appetite for the whole experience. This album was recorded by me, Bryan Shaw, at my studio in Costa Mesa, California, over 2 days in early November 2010. No overdubs. I met with Brad and John several time to brainstorm tunes, but no rehearsals. Dan had told me that he didn’t have time for any arrangements, then he showed up at the session with a key drive full of new charts, having stayed up all night for several days. We would record the charts as they came out of the printer. I picked the songs with my heart, not my head. The odd cover, initially a pencil sketch drawn by my daughter, shows a cozy old fashioned cottage with a garden and an old car. But when you open it up, you realize that there is a futuristic hovering BLUE spacecar in front. In the background is a big city of the future — and it may not even be earth. I enjoy old jazz, gardening, old values, and more. But I have my hovering space car to be able to function in the modern world. In my real life, I have fruit trees, extensive gardens, chickens, I raise fish in aquaponics. My roof is covered in solar panels and I generate all my own electricity. My hovering space car is my minivan that will drop me off at the airport for the next festival or cruise. My concept on this album was a response to the world as I see it today. I believe that people need to turn off the TV and follow their hearts. I decided to follow mine long ago. I wanted to make music, even though playing a musical instrument is impossible. If you give any adult a musical instrument for the first time, they can’t play it. To become a musician you have to do the impossible — every day, over and over, till some day you can do it in public. This CD is my attempt to put some basic principles of mine into music. TIME: “When” is more important than “What.” TONE: Be true to the voice you have. I don’t have a singing voice so I sing through the trumpet. ENSEMBLE: A good jazz ensemble is a spontaneous conversation of seven players, each with an story to tell. You can tell that we actually were listening to each other and responding to the conversation. DYNAMICS: A jazz band with dynamics! We did bring it down to simmer at times. HARMONY: I’m tired of jazz players making everything sound ugly. I’m tired of chord changes, I wanted chord progressions. MELODY: Another forgotten concept. I lose interest in jazz when the melody becomes “the head” and the ensemble becomes “playing the head” (in a bad unison). RHYTHM: I’ve been fortunate to play a fair amount of swing dances and I wanted this CD to be something people could dance to. Rhythm is really the foundation of jazz and it provides the when to the what. BLEND: Fit in, support, harmonize, another lost concept in jazz. 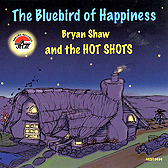 Bryan’s THE BLUEBIRD OF HAPPINESS exemplifies his beliefs in the most melodic, swinging ways possible. I’ve learned that wishes have power. What I wish for is that people buy this Hot Shots CD and find it as life-enhancing as I have. And then these same people make it known that they want to see this band in action. It could happen, you know. I didn’t want an iPod. There, I’ve said it. It must have been my perverse snobbery, my badly-concealed elitism. I made fun of the millions of people who had little white earbud phones in their ears and (for the most part) dreamy vapid expressions. I’d see them on the subway, where the clamor coming through those earbuds was audible over the roar of the C train. Did I fear that if I bought an iPod my musical tastes would become like theirs? I don’t know. I kept doing this even when Kevin Dorn, my spiritual guide in many things, said, mildly, that he had the 1940 Bud Freeman and his Famous Chicagoans session on his iPod and could thus listen to “Prince of Wails” whenever he liked. Even that failed to move me. Now I am not an unregenerate Luddite: I am addicted to email, and would rather hear 1929 Ellington on CD than on a V- Victor. But still I resisted. 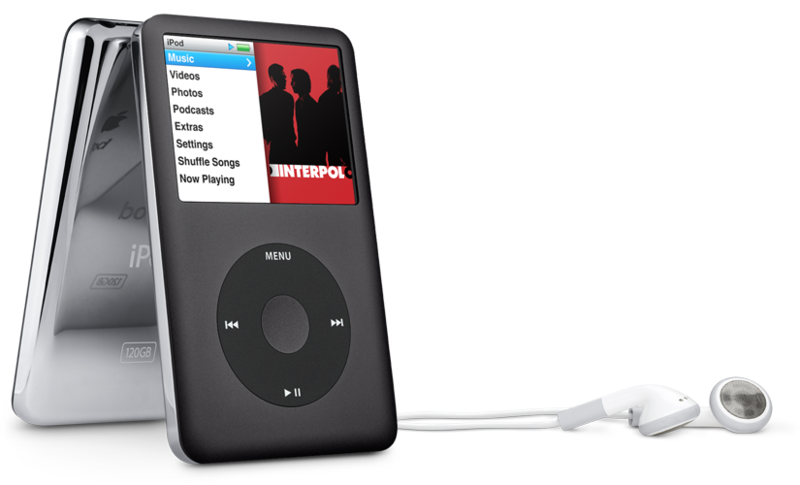 At some point, I began, reluctantly and grudgingly, to think about an iPod. Even when the Beloved insisted on buying it for me as a premature-birthday present, I was still worried, even suspicious. Part of the dread was, of course, provoked by the mythology that Apple and other firms have created, making a simple purchase seem unfathomable, mystical. I stared at the online displays, feeling overwhelmed and ignorant. Did I want a New Generation iPod, a Classic, a Nano? Finally, I gave in and asked the people who know these things by heart — my sweet-natured students, for whom Technology is a first language. To their credit, even if it seemed to them that Grandpa was asking about which skateboard to buy, they didn’t snicker but entered eagerly into the game of Teaching Their Professor. Emboldened, I bought a black Classic and plunged headfirst into the world of iTunes, and syncing. The result? Had you seen me on the Long Island Rail Road last night, sleepy and disarranged, with a dreamy vapid look on my face, you might have noticed the white earbuds nearly falling out of my ears (they fit poorly). But I was twenty feet underwater in my own version of bliss: Mildred Bailey singing “Little High Chairman,” a Buck Clayton Jam Session, Louis playing “Muggles.” Is there a moral? I doubt it. But pick your own cliche: 1) You can teach an old dog new tricks, or 2) Better late than never, if late isn’t too late.